Оne-stop shop for all your social media posting. If you like posting on social media, FREE OneStopPosting is the perfect app for you! 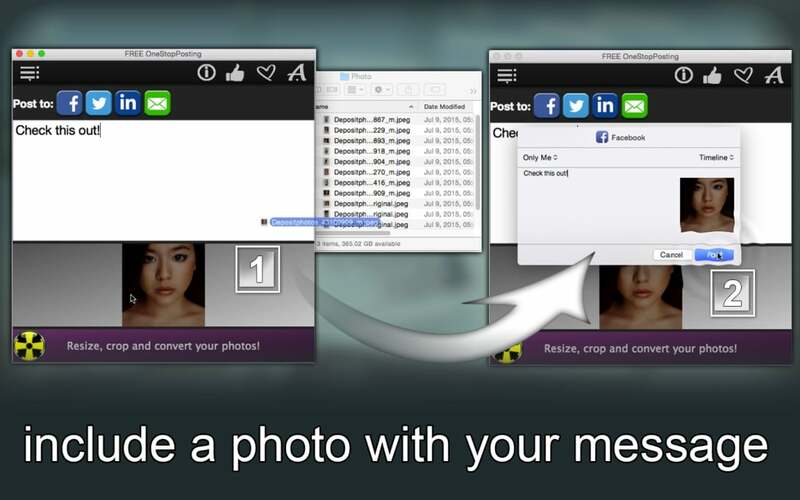 You can create your message once and send it to multiple social networks, such as Facebook, Twitter and LinkedIn! 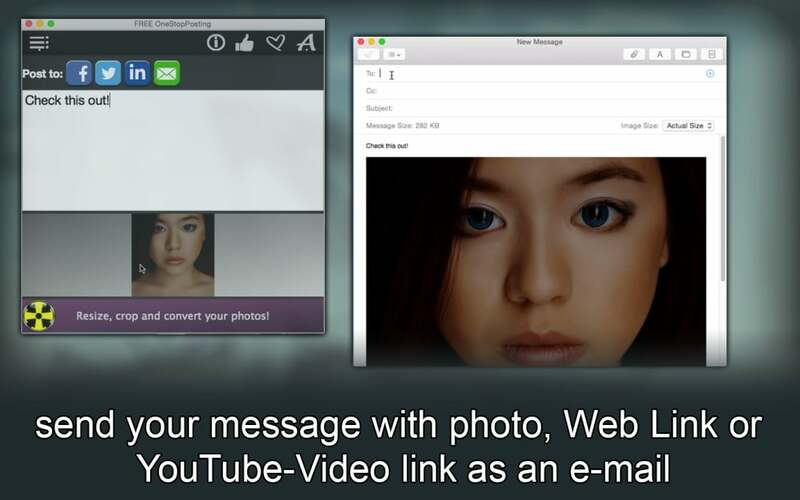 Type up your text, include a picture, a internet link or a video link with your message. 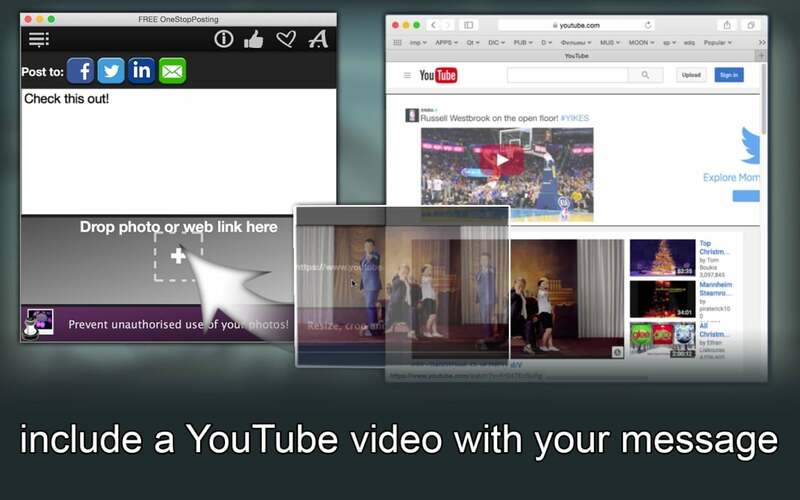 Post it to the social network/networks of your choice, or e-mail it using the same app. Done! Whether you like it or not, social media is an essential part of our everyday life. In addition to following the news, celebrities and trends, keeping in touch with our friends and family, we can also contribute our own content and reach a huge audience. This is where FREE OneStopPosting comes in. From amazing family pictures to the newest super-cool gadget your company just released, this app will help you spread the word about the newest things going on in your life or with your business. The unique feature of this app allows you to create your message once and post it to up to three social networks, like Facebook, Twitter and LinkedIn. You can even e-mail this message using the same app! This is how it works: you type up your message, Drag&Drop pictures, internet links or video links into the app photo/link window, and then click on one of the social network icons to post your message (If this is your first time using FREE OneStopPosting, you will need to connect your social network account or accounts). Done! If you need your message posted on more than one social network, click on the next icon. Need it e-mailed? Click on the green button with the envelope. It doesn’t get any easier than this! Download it now and enjoy FREE OneStopPosting! Hello and welcome to OneStopPosting! If you like posting things on social networks, this free app will really help. 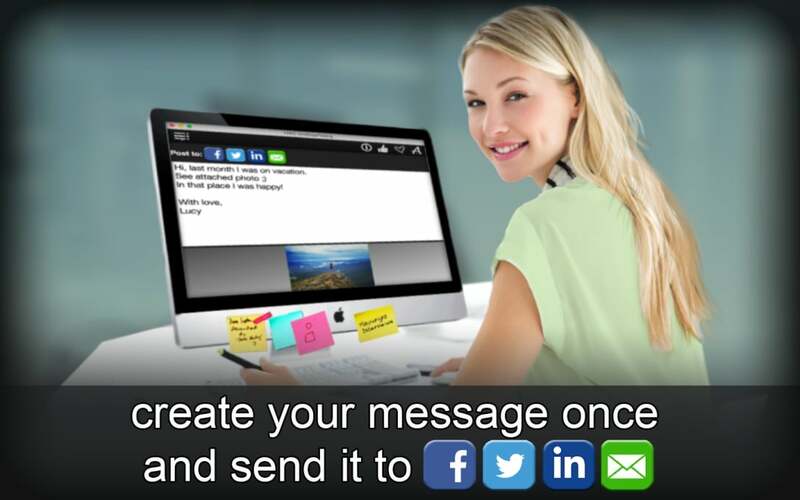 You can create your message once and post it to multiple social networks, like Facebook, Twitter and LinkedIn. You can even e-mail this message using the same app! 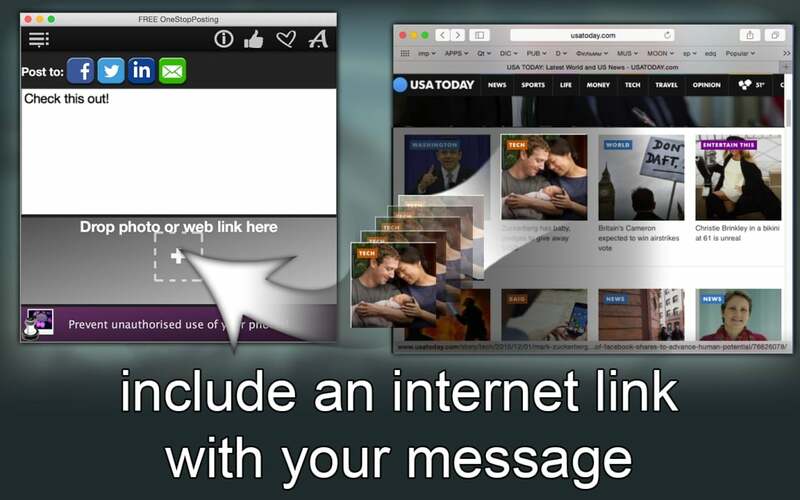 Type up your message, insert pictures, web links or video links and click on one of the social network icons to post your message. If this is your first time using this app, you will need to connect your social network account or accounts to the app. Now, let’s insert a video link. And post it! If you need your message posted on more than one social network, click on the next icon. If you also need it e-mailed, click on the green button with the envelope. And that’s it! Now you try it! Have fun! This is an AMAZINGLY GREAT idea!!! I am a new small business owner and even newer to social media. Using my phone I found it VERY time consuming posting to all my sites. I looked into different services all web based but your I liked very much because it is a mac program. Offered is only fb, twitter, and google+….which I have all 3. But I also flickr, tumblr, instagram, and yelp. Will these be added soon? While I very much also like the free this is something that I would consider paying for in a second $10.00….it saves me a TON of time. Thank you for your feedback! As soon Apple integrates in official API support for flickr, tumblr, instagram and yelp, we will do implementation to support these social networks in Free One Stop Posting!